Welcome back! 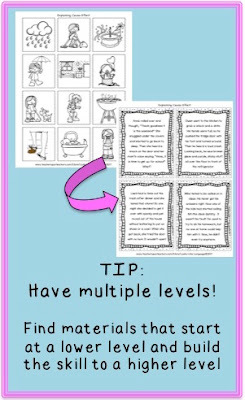 I hope the weather is a little sunnier and warmer to get your students in the spring mode to enjoy this fun little game! This week, you can download the second set of game strips and cards for FREE! Work on any skill and then take a card to be the first to make the whole color matching set. Grab the updated set here! It is spring! Every year, it is such a nice change to be able to get outside and see nature start to blossom. If you missed my last post on the importance of teaching students about change, especially our non-flexible thinkers on the autism spectrum, click here. This week, I am joining with The Frenzied SLPs to give some fresh ideas to help grow your therapy ideas! These links are worth checking out- every SLP is very capable, motivated and provides some great ideas based on her experiences in therapy. It's like getting a spring time therapy present! Be sure to click on the link below to open all of them. Thanks to Annie at Doyle Speech Works and Sparklle SLP for organizing us! In my therapy room, we have a lot of fun talking about April Fool's Day pranks. When I am lucky, a trip to Target or the Dollar store will provide me with some toy pranks to try out, too! A whoopie cushion is an old stand by joke that is easy to find anywhere, and kids never get tired of fart jokes and pranks. Besides being fun, talking about pranks gives us a perfect, real life opportunity to talk about how people have different perspectives, and how important it is to pay attention to others' feelings and viewpoints. One kid might find it hysterical to walk into a hanging spider, while another child with a fear of spiders might be terrified. -Did the person have any way to know this ahead of time? -If it ended up being hurtful by accident, what should they do? -Who should have the biggest part of the decision in the end whether a joke is funny- the person doing it or the person it is being done to? YouTube is another great therapy resource. I love real books, but buying them can add up costs very fast. 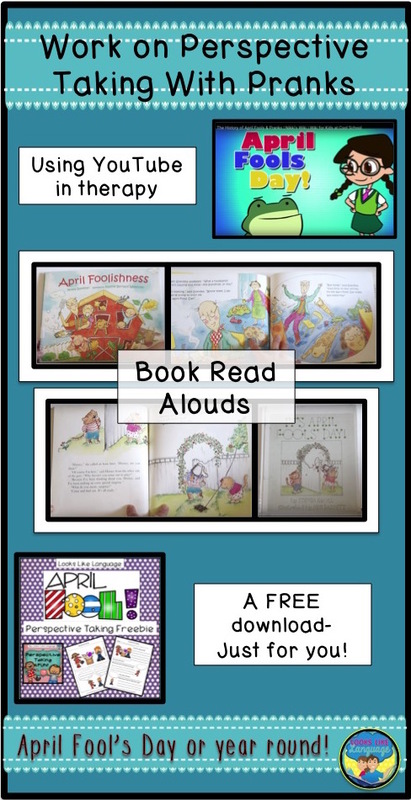 So, for short therapy time activities, like this one, I have found great read alouds on YouTube to add to my therapy activities. Here are some varied choices I just found. April Foolishness by Teresa Bateman is a very cute story for younger kids. The plot involves grandma and the grandkids playing an April Fool's trick on Grandpa at the farm, involving all of the animals getting loose. 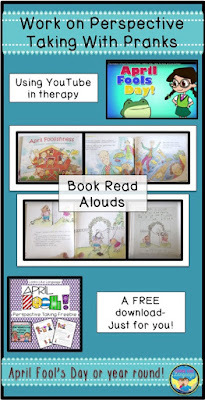 It's April Fool's Day by Steven Kroll is a good choice for discussing both bullying and fun tricks. In the story, Alice gets back at Horace the Bully by playing April Fool's tricks on him when he won't leave her alone, including some of the ones he plays on her all year long. 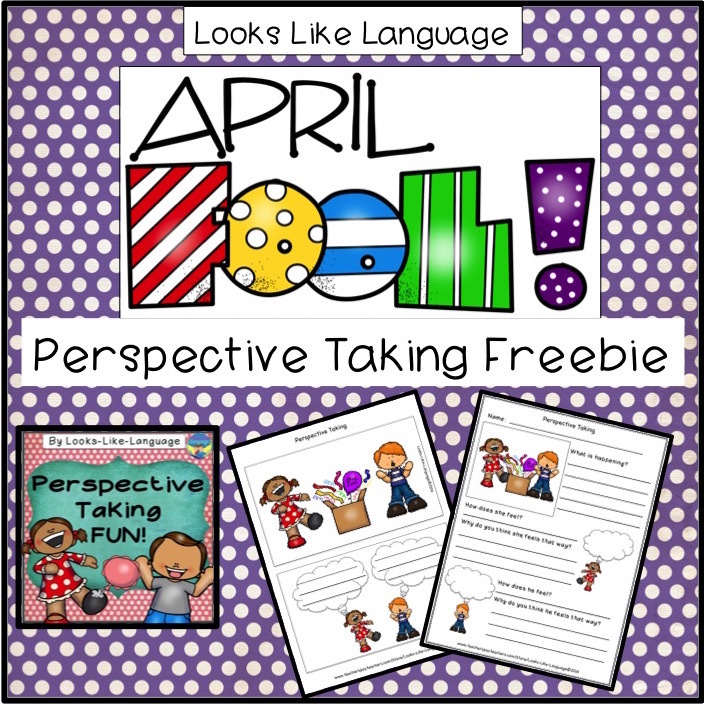 Last, but not least, I wanted to share with you a free addition to my Perspective Taking Fun packet in my store. This type of freebie is usually one that I only share with my newsletter members, but I wanted to share one with all of you to welcome you to my blog. 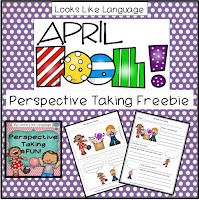 You can download the freebie here, or get the whole packet at my store. I hope you have fun with pranks! 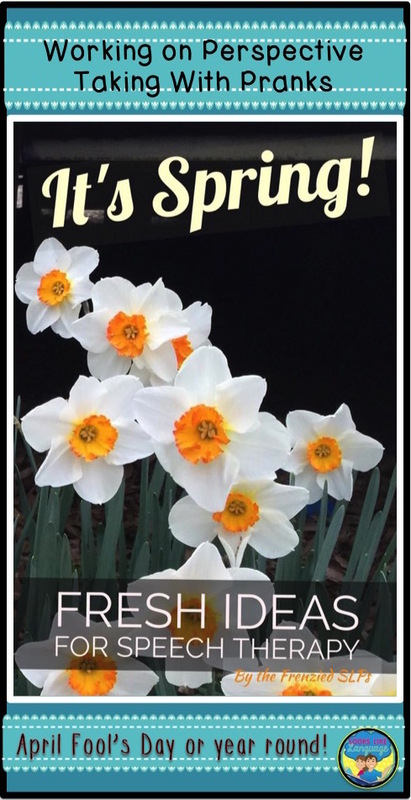 Whether your winter was an easy one or a cold one packed with bad weather, there is always something wonderful about spring arriving. The calendar said it started this week, so hopefully you are seeing some signs of spring coming wherever you are. Even if you aren't yet, you can get into the spring mood with the delightful chicks, eggs and bunnies in this open ended color matching game. Work on any skills, then students take a card to fill up their game board! You can download the updated version here. I hope to see you next week for the next FREE section of the packet! Change can truly be hard, even as capable adults, so it is not surprising that it is even more difficult for kids. Add on some communication difficulties, sensory problems, and a struggle that is already in place to make sense of a world with rules that are not understood, and it is no wonder that some of our kids have meltdowns when there is a change. In the northeast, spring can be a time of very visible change. In therapy, I like to make use of this to help my students understand what the word 'change' means in a non threatening context. It helps them to see that some changes can be positive, and handled, to help them make a bridge to coping with less welcomed changes. I'm sharing some photos of activities that are well loved and well used to let you see an example. The bottom left photo is an activity from a very old Sesame Street magazine. My students just loved it and learned that change can be fun! 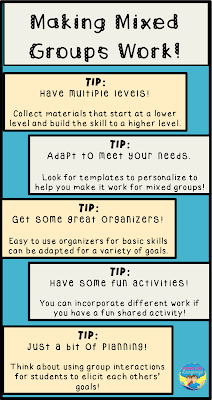 If you know about current places to get these types of activities, please comment with your resource. If they aren't available, I might give a try at making some because they work so well for eliciting this language! Next you need a good hands on activity! If you have a small caterpillar and a butterfly stuffed animal set, follow the picture directions to make a fun hands on activity! 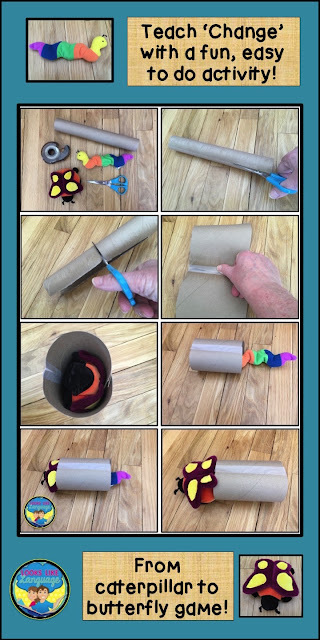 You just need a paper towel tube, scissors and tape to make it. 1. Cut the paper towel tube in half lengthwise. 2. Cut the tube in half across the width. 3. Tape the pieces back together to make a cocoon. 4. Hide the butterfly inside. 5. Push the caterpillar into the cocoon and watch the change! 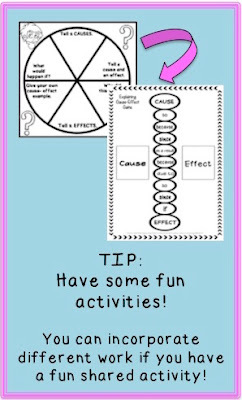 How about turning a worksheet into an activity? I love this one adapted from a Frank Schaffer worksheet where they can change a picture scene of winter to one of spring by placing the new scenery on top. To play this game, the students need to request which picture they want to change! 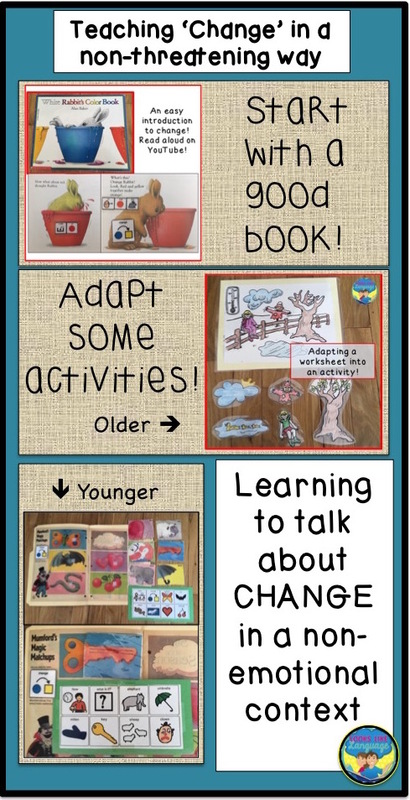 Requesting a change may be a new experience for some of our kids, but it is functional for them to use when they don't like something that is going on. A follow up activity is to have them color the picture afterwards, but sabotage the situation by giving them the wrong color or the kind of marker/crayon/colored pencil they prefer the least. Prompt use of the word 'change.' "Oh, you didn't want blue? You want to change the color?" For older kids, it is fun to use silly pictures. After they identify what is wrong in the picture, have them explain how it should be changed to make it better. How about a card game? Matching games with pictures of natural changes also work. Changing caterpillars to cocoons to butterflies and solid (snowman) to liquid (water) are common examples. When students have the language to think and talk about change in positive as well as negative ways, it is a necessary stepping stone to having more flexible thinking and problem solving skills to help them cope when changes occur. What are your favorite ways to teach about change? You are here just in time to celebrate St. Patrick's Day! The game board and matching cards at my store are open ended, so you can add a touch o' the green to any work you are currently doing! 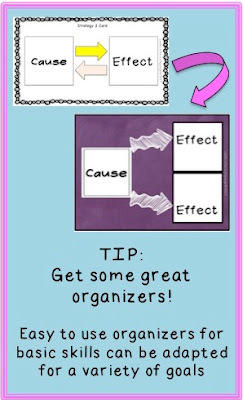 Have your students write their spelling words on the back and use them in sentences during the game, or maybe you want to write some math problems or multiplication review. 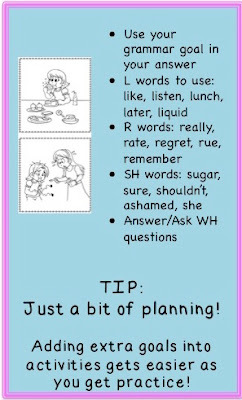 SLPs and early educators will love the sets on my blog for language based activities this week. Have a happy St. Paddy's Day! 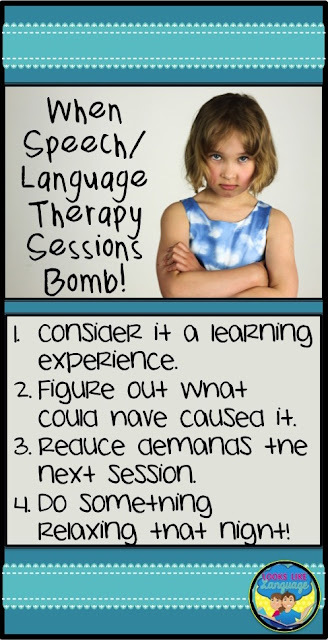 When Therapy Sessions Don't Go Well- 3 Tips to Save You! Every child is unique! Recently I've been thinking about how much I have learned from all of the students I worked with over the years. Every child has their own combination of strengths and weaknesses, along with their personal qualities, that makes our field continue to be interesting over the years. We have these 'AHA' moments when we realize what we need to do to reach that child. Then we bring those skills forward with us to all of the rest of the children we meet, continually adding to this skill set, but it is hard work along the way. 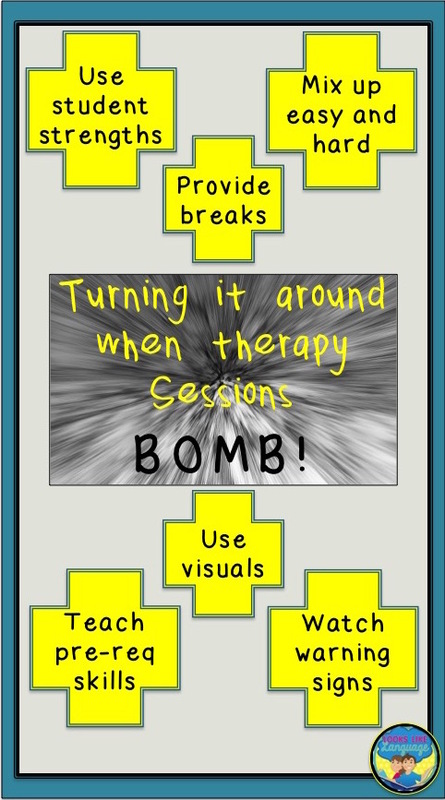 Sometimes therapy sessions bomb! I tried to figure out how many students I have worked with over the 40+ years (if you include my clinical years) and gave up on the math, but it is truly a huge learning experience! Almost all of these students had language problems, and most of them had multiple disabilities. So, how do we do it? I know that I currently use strategies and techniques with very difficult students, often not even thinking about it, but it took years of learning and more than a few less than perfect sessions to get to this point. So what can I offer to help you out along your way? Let's talk about low functioning students today, since they present with the most difficulties usually. 1. Consider it a learning experience. When I am able to structure my approach correctly, I leave the therapy session feeling a connection with my students and that I have made an impact during our time together. I love it! But I have learned a lot from my sessions that did not go well. It sends me back to the drawing board to examine where it broke down and figure out what I need to do differently next time. 2. What could have caused it? *How much of the session had the student been attempting something new? *Did I switch between easier and harder tasks? *Did I provide enough breaks? *What are my student's strengths? *Did I utilize and build on strengths during the session? *Examine the language demands: Did I jump up too fast? Was there an intermediate step that could be take to reduce the demand? *Did I react to my student's warning signs or did I try to push through? *Did I switch to a learned, enjoyable activity after a prompted response when I realized it wasn't going well so that the session could end positively? *Is there a way to show the student visually what is expected? 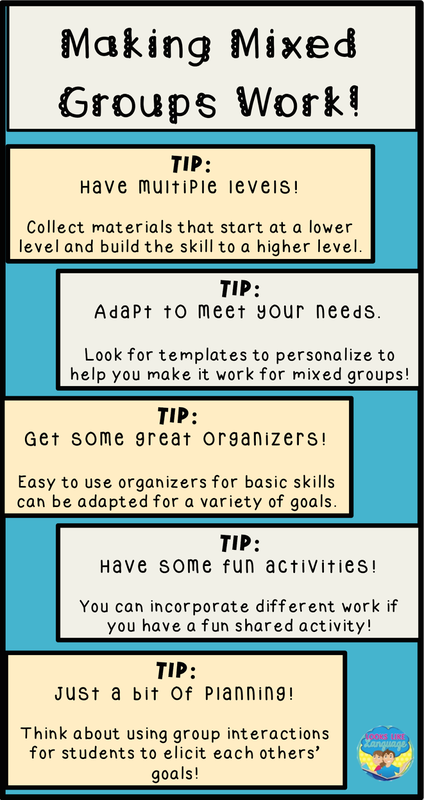 *What supports can be added to the activity/task to make it easier? *Are there pre-requisite skills that are missing and need to be taught first? *Is this activity/skill really needed at this time? 3. Reduce demands the next session. After a difficult therapy session, I always go home feeling upset and then feel apprehensive before the next session with that child. Think how much more so the child must be feeling! It is important to be able to keep your bond with the student intact so that learning can occur! Plan on entering the next session with the first activity being the most enjoyable one the student has. If that goes well, repeat the last activity that was learned and went well, to maintain skills, and then return to another easy and fun set of activities to end the session positively. WHY? This benefits you by giving you more time to think about all of the questions and come up with an alternative plan. It is beneficial to both of you to have a positive experience, reduce the chance of building more communicative failure and thus behaviors, so both of you will enter the next therapy session with a more positive attitude. No one likes those days when things don't go well. Not us, and not our students, either. I would go home wondering if this is was really what I wanted to be doing and why in the word did all those years of schooling not prepare me for this. Thank goodness our caseloads are usually mixed, so there are some good sessions as well to balance out the day! The difficult sessions motivated me to learn more and to think more about my plan for that child. These steps (and quilting time, a glass of wine, or a good book that night!) helped me, so I hope you will find it useful as well! Are you ready for another freebie? Thanks for coming back! I'd hate for this fun set to sit there lonely and unused! Don't you think that kids learn best when having fun and that being able to utilize skill in a natural activity shows that they have really learned it? That, besides fun, is what makes open ended games so useful! Including activities for holidays in your therapy room or classroom is a wonderful idea for several reasons. 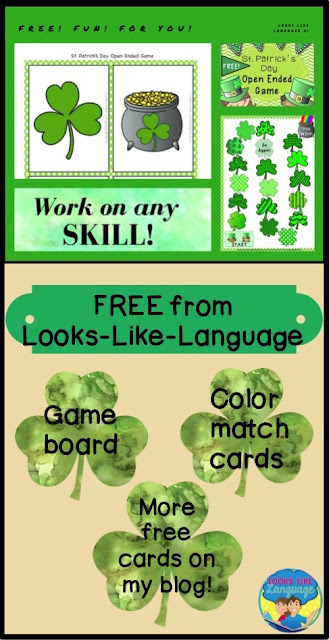 🍀It helps students gain a sense of time, which is a very difficult skill for students who have language/learning disabilities. 🍀It increases multi-cultural awareness, a much needed quality for tolerance in today's world. 🍀It is just plain fun! 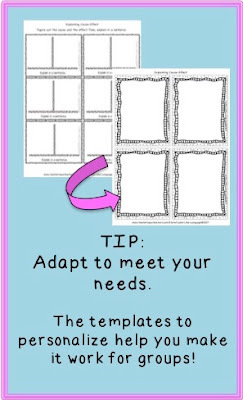 To help you accomplish all of these goals, I'm sharing my open ended FREEBIE from my store. Please leave kind feedback there if you like it! It means a lot and motivates me to continue making freebies!